What a man! North Korea's Fearless Leader Kim Jong-il never forgets a phone number, a cadre's career or a line of computer code. He even shot 11 holes-in-one in the very first round of golf he ever played! 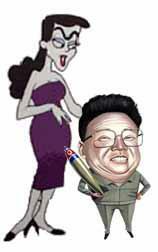 Shown here with his rarely seen wife, the stately Natasha Fatale, Kim may be short of stature but he is tall of tales!